Snow run at Vogel State Park on the Coosa Loop! What started out to be a long day of running 2 loops of the difficult Coosa loop at Vogel State Park turned into something completely different...and amazing! How do you explain to people that you managed 12 miles in 3 hours.....not a typical hard run, but today was much different. Sean, Matt, and I arrived at Vogel to find there was no way my car was getting down the road to the parking lot. The snow from a few days earlier had made the drive in impossible....and was foretelling of things to come. After parking on the side of the road, we made our way to the ranger station to check in....which is required for people hitting the trails. Needless to say, at 15 degrees and a ton of snow, the park staff were mildly curious as to our plans. The questions were; Do you have food and water? He wrote down minimal. First aid kit? No. Cold weather gear? He sized us up (Sean was wearing shorts!) and wrote down minimal! It was gonna be that kind of day! We hit the trail and almost immediately the snow got deeper.....maybe 6-10 inches to start. We got in about 2-3 miles and the drifts got deeper....in some places 2-3 FEET of snow. Needless to say, running was opportunistic at best! The 3 mile climb up to the top of Coosa started.....it's steep and even on a good day takes 45 minutes.....and it took us an hour and a half! Ice chunks were literally forming on my shoes and tights. Falling was frequent and comical. After enduring some pretty cold temps and lots of SLOW going, we decided to bail off the trail and run the road back down to the park.....skipping the final climb and descent of Slaughter Mountain. The distance was much less than we had planned, but an overall AMAZING day of fun in the snow and incredible views of North Georgia from the top of Coosa Mountain! The GUTS crew held the 3rd annual Mystery Mountain Marathon on 10-10-10....cool date and with the name it was officially M cubed on 10 cubed. Cool! After three weeks of constant travel I was, to say the least, well rested! I'd maybe averaged 40 miles per week leading up to the race with zero runs over 10 miles...OUCH. So expectations were low low. The race was one of the best organized I've ever seen! For someone that has gotten lost on plenty of trail race courses, I think Kim (RD) made sure nobody would get lost....one of the best marked trail courses I've ever seen. The NY Times published an interesting article that very much aligns with my thinking.....you gotta be ready to feel the pain and suffer a bit! For those that know me, I hold myself to very high standards in almost everything I do....work and play. So my reaction of others to the upcoming Hot to Trot was interesting. I'd had a good year of running......I'd gotten 4 or 5 overall wins including in last years Hot To Trot, my first 100K at Iron Horse, and the SweetH20 50K. But I am still a rookie. Certainly not a rookie at running......I can't even calculate the number of races I've run over the past 20 years. But a rookie at really long time/distance running. I found myself in the unusual position of feeling pressure about a race. Some of my running friends had high expectations of me and this really shook me. When it comes to racing, my promise to myself is that I always give it everything I have on that particular day. I can't even remember sandbagging a race and have never had a DNF. When I'm done, I want to feel like I left 100% of me on the course regardless of the distance. But I am human and have good days, bad days, and am sometimes very well prepared and sometimes not so much. I went into the Hot To Trot pretty well prepared. I am not someone that goes crazy on training for a particular race. I log 50-70 miles every week regardless and have not, for several years, done much terribly special to prep for an event. This approach has served me pretty well in the past but has limits. It felt like a family outing when I showed up at Sweetwater Creek State Park for the race. I knew many people and made some new acquaintances as well. The ultra community is an amazingly cool group of people. This years race was billed the "Clash of the Champions" as it was the 10th year of the event. All past winners were encouraged to attend and even got complementary entry. But looking over the entry list, I knew the race would be between myself and Jon Obst. He is an amazingly strong runner and I barely edged him at last year's event. I had taped an 8 minute and 9 minute pace chart on my arm. I proved worthless for the entire race. I finished the first loop at 7:10 for a 1.17 mile loop.....and proceeded to keep that pace for almost 10 laps. It was gonna be a long day for sure. The hill on the back side of the loop that I plowed up for the first 10-15 laps started to feel like a real hill....which it was. Managed to get a full lap up on John after about 25 laps but I knew it was going to be a touch day for me when I finished 30 miles in the first 4 hours. Not appropriate for August heat, my condition, and the terrain. After about 5 hours, I was hurting like I'd never hurt before. I had taken a small spill and it caused a massive knot in my left quad. That and a far too aggressive pace brought my pace to a shuffle instead of a sprint. Back to that pressure thing. I finished on loop and told a good friend and GUTS member that I was close to done. With nothing but good intentions she said something to the effect of "come on, I've got money on you". I admit I about lost it. I was struggling, hurting, and ready to call it a day. This comment was the last thing I wanted/needed to hear. I wanted to hear "hang in there....you are doing great". Got plenty of those, but the pressure comment just didn't sit well. After 3 more hours or struggling and a little reflection, I can honestly say I am more proud of my performance at Hot to Trot than any other race ever. I didn't win, it wasn't a time/distance personal best. But I fought off a huge number of demons to finish the race. It took more mental and physical effort than any other race and 53 miles and 2nd place felt like one of my best performances ever. .....was it a huge disaapointment? .....was it a race I can be proud of? It was really somewhere inbetween. The Twisted Ankle course is hosted by RD Becky at James "Sloppy" Floyd State Park outside of Summerville GA. While much of the trail is very runnable and fairly good footing, Becky has designed a course that makes this both a great run and one that will put a serious hurting on ya! Met up with Nils bright and early for the drive up. I'd had a tough few weeks at work and wasn't really mentally stoked for the run. But I always know my attitude tends to perk up when the race number goes on! Plenty of GUTS runners up representing both the half and the full marathons! I'd had a decent race up there last year and was hoping for a good repeat. At the start line, I see the incredible Malcolm Campbell and ultra-stud Dewayne Satterfield lined up for the full marathon and I knew I was in for a tough day! The course starts with a nice loop around a lake then it's time for the first surprise of the day......Becky's Bluff. It's an insane mile stretch that goes very sharply up! Needless to say, there are periods of walking required! I had started out with Malcolm and another guy running the half and soon both were out of my sites. At the top of the ridge, the marathon takes a sharp right and goes for a couple miles before starting a gradual but long decent back down most of the mountain where it turns around and sends you right back up. I got a good measure of how far up Malcolm was at this point and he was about 5 minutes ahead by mile 8 or so. I figured he'd take me by 20+ by the end of the race! After a return to the place you entered the ridgeline, you go the other way out and back. This is where the trail gets really nice! Beautiful rolling singletrack for 3-4 miles before you are dumped out on a gravel road for a mile to the turnaround. Got another look at Mlacolm and figured I was not only about 3 minutes back......some excitement started.....could I find enough to catch him??? The return trip was nice since I got to see a bunch of friends on their way out to the turnaround......lots of good cheers going both ways! Nils told me Malcolm was slowing and that I was maybe 2 minutes back. I made it back to the top of the mountain in pretty decent time and the aid station folks told me he'd just left 45 seconds ago! It was largely downhill from here.....not my strongest suit but I was refreshed and ready to try to make up the 45 seconds! Half way down, I came to a 5 trail intersection and stopped dead.....I didn't know which way to go! Panic sat in. I collected my thoughts and looked for markers. There....a blue flag! I set out and soon started heading up. I certainly didn't remember that from last year, but then again it was a year ago. After about 7 minutes I realized I was headed BACK up the mountain.....not good. Turned around and flew back down to the 5 way....but still didn't know where to go! I picked the next best choice and plowed forward. My choice was again incorrect and ended up on a road a mile later. I could see the finish, but I hadn't run the right course. Given that I still didn't know the right way, I headed towards the finish. Crossed the line in 3rd about 13 minutes behind the winner. and told the RD I had not followed the proper course....but that I had certainly run extra. Becky was kind enough to give me third anyhow. Disappointed.....a bit. I really deserved a DNF but had more than earned 3rd. Happy with the effort....I gave it all I had! Jonquil City Jog 5K - The Gremlins Continue! I remember laying in bed 6 years ago on a Saturday morning, tired from a late night out Friday. I had intended to get up and run the Jonquil City Jog 5K right up the street, but sleep called heavier than the race and I turned off the alarm and slipped back into a deep sleep. 8:00 am....I heard the bullhorn announcing the race then the gun firing......and the guilt sank in! I vowed to not skip a race within walking distance of my house ever again! 5 years later, the same result......a 2nd age group finish. While I am in no way displeased with finishing 2nd, the rub is this; They give Key Lime Pies to all AG winners. I've missed one 5 years in a row! A couple years back, my bud Ron (the the 40-44 AG) finished a couple minutes back of me and got a pie....and I have yet to live it down! Race time approached and the roads were slick and heavy with rain. It was coming down lightly but the wind was kicking pretty good. I ran into a few ATC guys right before the race start and new my chances just took a turn for the worse! As always, they put on a great event here......good organization and a fairly fast course. I ran well and after the first 1/4 mile didn't get passed and picked off 3-4 people along the way. Finished feeling strong in 8th place at 18:04....and 2nd AG! No pie again this year! Life isn't all about pie (I probably wouldn't eat it anyhow).....but one day! My first time running SweetH20 this year. Johnny puts on a great event! Very pretty trails at Sweetwater Creek State Park in Lithonia Georgia. Some nasty hills. Like many ultras, it was....um....close to 50K (I swear it was 2 miles long!). I have come to realize that there is very little personal accomplishment without friends and family there to provide support and encouragement. So while this might be a report out on my first 100K, it's really a reflection on all those who make each of us who we are. About 2:30 Friday, I started to wonder what I was getting myself into! Delane picked me up at work and the snow was coming down hard.....and we had a 360 mile drive down to Orange Park Florida.....the hotel location for the Florahome, Florida Iron Horse Endurance Run 50M, 100K, and 100M event. After 4 hours of driving snow and sleet, we finally popped out of the severe weather and I was able to think about the fact that that I was running my first 100K in 12 hours. I started the year with the goal of running 100K and began looking for suitable events.....and realized quickly that many were already filled. A GUTS member pointed to the Iron Horse Endurance Run. My first thought: Florida should be nice and flat. Somewhat a distant second was the realization that the race was like 4 weeks away and my long run in the preceeding 2 months was a leisurely 13 miles on the Silver Comet trail. Never claimed to be real bright! A quick email to the race director Chris confirmed there was still space and with little thought I stuck and stamp on the envelope and my fate was sealed. My friend Nils pointed me to another GUTS guy, Ryan Cobb, that was running the 100 miler and I was happy to have someone to meet up down at the race. We both arrived too late for the race briefing at the hotel and after a brief 5 hours of restless sleep I tapped my wife on the shoulder and told her time to roll! It was a good hour drive to the start (Florahome is not close to much) and I cruised in around 6 with an hour to prep for the start. The Iron Horse is held on an old railroad bed. The tracks are gone but not much else in the way of improvements. Lots of gravel...more on this later! It was a simple route....out 1.75 miles, turn around, back to the start/finish, then a long 11 mile out and back for a 25 mile round trip. I'd do the full loop twice then cover 12 miles to get the 62 mile distance. Lots of nice people milling around before the race and a warm fire to help out with the chilly 38 degree temps. And we are off.......after the 3.5 mile out and back I realized that flat didn't always mean easy! The trail was somewhat rocky and LOTS of spots with gravel that played havoc on the legs.....always had to watch the footing and I knew the uneven terrain would only get worse as the body tired! The first 25 mile loop came and went with little fanfare. Got to see Delane at a few aid stations (very friendly course for spectators) and it brought a smile to my face each time. But I knew it may be a long day when I realized that my watch said 3 hours flat. That was marathon pace, not 100K smart. I made a mental reality check and backed off to a more sane pace. Loop 2 was a much more sane 3:38 time. I was beginning to really look for my beautiful wife at each aid station for that smile and word or two of encouragement. Much needed. I was at 50 miles and knew it'd take all I had to do the final 12 miles. I was still running at this point but the pace was dropping fast! I never thought I could hate something the size of a gold ball, but I started to really dislike the gravel! It had beat up my feet and legs for 50 miles and I swear I stepped on every errant stone the entire rest of the run! I took a few brief walking breaks to try to muster the energy for a decent finish and when I realized I had a mile to go there was much renewed energy....something about finishing my first 100K gave me new found strength. I can't describe the pleasure of crossing the line with my wife's big smile and the RD handing me my first belt buckle. It's something maybe only ultrarunners might know. I'm usually pretty interested in how I placed, but in this race it seemed almost secondary that I'd managed to cross the line in 1st place in 8:38. Happy with the win, but more excited about the finish. I was so pleased to see Ryan Cobb wrapping up his first 50 miles and heading out for the next 50 looking fresh and energized. I had no doubt he'd bring it home! 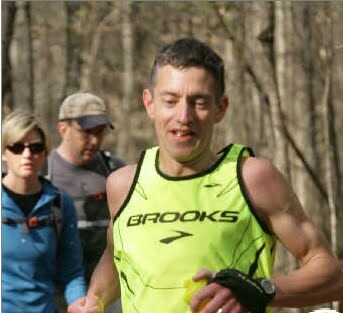 He finished his first 100 miler in 22:11. DWD Ryan! A huge thanks to my training partners, friends, family, and especially my wife. She spent her Valentine's weekend standing out in the cold for 9 hours...her strength is my strength. With my first 100K looming in a week, I was only slightly excited about the GUTS Red Top Rumble 11.5 mile trail race on Saturday. My mind is focusing on a LOT of time on my feet next week and I hadn't been able to get jazzed about a trail race like I might normally. Dave and I met up of Barrett Parkway to make the last bit of the drive up together. It was a cold morning so a coffee was in order. A cup of joe and interesting conversation with the mini-mart employee around 7 am livened up the day. We got there a good hour early after a bit of a slide on some black ice headed into the park. Was hoping the trails weren't as icy as the road! As usual, the GUTS folks had everything well organized at the start. Dave and I got numbers and then headed back to the car to stay warm and have some in-depth discussions about what clothing to wear. He convinced me that a single thin shirt would be fine and that he was wearing the same.....more on that later. .....and we are off. I'd decided to wear trail shoes but after the first three miles I was wondering if it was a smart choice. The first stretch was fairly flat, wide, and smooth trails and I was ticking off well under 7 minute miles.......and then the fun started. I saw a course arrow point left and look over and thought "where is the trail?". We turned onto what appeared to be a small stream! It was tight, wet, and hilly for a bit before we popped out on a fire road of sorts. A quick stretch on this and then a HUGE step up a bank back on to a nice single-track trail. The first hill had me a bit worried, as I got to the top and my legs felt like lead. Lots of miles the last month and I could feel every one of them. From this point it forward it was 8+ miles of up and down. Go up a bit, drop back down by the lake, repeat. The hills weren't too steep or too long, but they kept coming. I'd drop down by the lake and knew I'd be headed back up real soon. I got in to a groove and stayed fairly consistent with low 7 miles. I was 5-7th for the entire stretch..couple people passed me, I passed a couple people. But mostly I was alone and that is how I like it when I'm racing. Plenty of aid on the course.....must have been 4 opportunities to get water/sports drinks/food but it was too cold to stop and I pressed on passed each on. Finished up strong and placed 5th OA in 1:18:19 for the 11.5 miles. Can't say enough about the volunteers before, during, and after the race. First rate! Post race, Jaydene the RD pulled out all the stops with the food and giveaways! Tons of items raffled off. Barbecue, sides, bars, COOKIES, and a bunch of hot water and hot chocolate/coffee/soup mixes served up by cheerful volunteers. I mean......for a race of 350 it was out of this world! Can't say enough good about the course.....absolutely beautiful trails. So many great views of the lake. All in all an excellent way to start the day. Garmin Connect Profile: Watch showed 11 miles even but it tends to miss a bit on the twisty trails. Ran the ATC Resolution Run 10K today. Nice crisp morning with a stiff breeze. Ran well given the wind a a decent tough course. 5th OA and 2nd AG I believe. 37:23. Props to the ATC for getting a big crowd. First time you had to pay for the race, but it helped draw a big crowd.